24.5 cm by 18 cm. 22.6 cm by 15.5 cm. 11.7 cm by 9.4 cm. 11.4 cm by 15.1 cm. 12.6 cm by 13.2 cm., with accompanying text. 23 cm by 15.2 cm. 16.5 cm by 29.8 cm. 26 cm by 14.5 cm. 14.2 cm by 20.6 cm. 26.2 cm by 18.3 cm. 15 cm by 21.3 cm. 22.4 cm by 17.5 cm. 18.4 cm by 24.6 cm. 28.5 cm by 19.5 cm. 19.6 cm by 24.2 cm. 24 cm by 17 cm. 24.5 cm by 20 cm. Find the call number for a map in the collection, or browse holdings by title and description. The Florida Historical Map Collection is one of the treasures of the P.K. Yonge Library of Florida History and contains more than 2300 images of Florida dating from the early 1500s to 1926. The earliest original printed map in the collection is Girolamo Ruscelli's Nueva hispania tabula nova, [Venice, 1561]. Researchers should read the rules for use and reproduction of maps (below) before requesting items from the collection. Other cartographic images of the state, including Sanborn Insurance maps, aerial photos, satellite imagery, and U.S.G.S. topographic maps, are curated at the Map & Imagery Library in the Marston Science Library building. Approximately half of the images in the Historical Map Collection are original prints or drawings. The collection also contains images of important Florida maps held by other institutions and reproduced as photographic or photostatic duplicates in our collection. These reproductions feature items from the National Archives, Library of Congress, Archivo General de Indias (Seville), Public Record Office (London), and other museums and libraries. In our collections you can see examples of such beautiful maps as the hand-colored Abraham Ortelius map of Florida from the Additamentum, Theatrum Orbis Terrarum, of 1584, which shows Native American towns mentioned in the de Soto chronicles, or the 1606 Mercator and Hondius map of Virginiae Item et Floridae with its inset of Timucua Indians. The English attack on St. Augustine in 1740 is depicted in a gracefully tinted work by Thomas Silver, and you can chart a route along Florida's coast through Bernard Roman's Gulf and Windward Pilot of 1794. The works of other important mapmakers and cartographers, such as Guillaume Delisle, Jacques Nicolas Bellin, Johann Baptist Homann, and Thomas Jefferys, are prominently represented in the collection. Original hand-drawn maps include an 1802 sketch of the town of Pensacola and its environs; an 1839 Second Seminole War map of Lake Okeechobee showing the location of military camps and an ancient Indian mound; David H. Burr's and Henry Washington's 1846 map of the Arredondo Grant between Micanopy and Gainesville; and a survey book of Alachua and Levy counties by J.M. Rickards made in 1885-1886. The library also owns many books, atlases, and government documents containing fold-out maps, as well as a collection of railroad and land promotion maps. The Library does not loan maps except for exhibits. All maps must be used in the Reading Room of the Department of Special and Area Studies Collections, located on the second floor of Library East. Patrons are restricted to requesting five maps at a time. 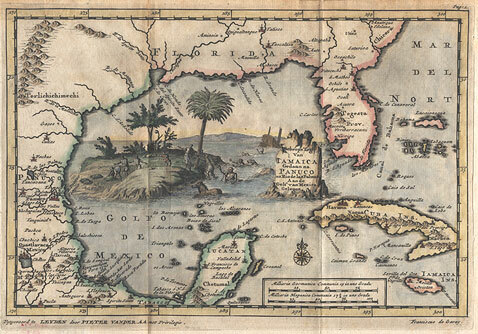 If you intend to do extensive research involving the map collection, you should make arrangements in advance with the curator, Dr. James Cusick, Special Collections, George A. Smathers Libraries, University of Florida, Gainesville, Fla. 32611-7007, (352) 273-2778; jamcusi@uflib.ufl.edu or jgcusick@ufl.edu. Limited copying is allowed but you should get permission from staff before making copies. Arrangements can be made to make scans. Tracing of maps is not permitted. The library will gladly give permission to reproduce maps for book, magazine, or journal illustrations, or as slides or images for talks. Please apply to the curator for the appropriate form.